Getaround is basically an Airbnb for car owners. Unlike Lyft or Uber, where the owners actually chauffeur you around, Getaround is a person-to-person carsharing service that allows owners to make their personal cars available to rent. I’ve used the service a handful of times now and along the way, I’ve picked up some tips to make the Getaround process as simple and convenient as the service sounds like it should be. 1. New Getaround User? Get Verified First During my first couple rentals, I was able to download the app, input my credit card and start looking at cars on-the-spot. GetAround added a verification process that requires approximately 12-36 hours to approve a user. If you’re hoping to install the app and rent a car immediately as a first-time user, you’re going to get frustrated. Get verified by registering and sending over your drivers license. 2. Use the Filters Obviously the draw of the Getaround service is the convenience of renting a car that’s not only within your budget but hopefully a car that’s nearby. The closer a car that’s within your budget, the more convenient the service is. Within the Getaround app, you can adjust the per hour cost and move the map around to see the nearest cars. In addition, you can filter cars by type, make/model, automatic or manual as well as whether the car is privately parked or parked on the street (more on that in the next tip). 3. Dedicated Parking Depending on your location, budget and patience, I always find that it’s best to rent a car with a dedicated parking spot. This is one of the ways you can use the filters within the app. You can toggle it on and off. Yeah, get a dedicated spot. ESPECIALLY if you’re returning a car to a neighborhood at a time infamous for bad parking (e.g. Mission on a Friday night at 9PM). In San Francisco, Getaround rents out dedicated spots within parking garages, if it comes down to renting two cars; one without dedicated parking and one with, go with the dedicated parking. It makes returning the car less stressful because you don’t have to budget in an extra 15 minutes to look for a spot when you already know you have a parking spot. 4. Just 1-2 people? Rent a Smart Car If you’re not moving furniture or packing more than 2 people into a car, then rent a Smart Car. Not only do they feel like you’re driving a normal-sized car, but these little two-seaters are ALWAYS the least-expensive cars to rent from Getaround and usually by a long shot. For example, I rented a Smart Car during one of my trips for approximately $4/hour. If you think about it, that’s less than calling a Lyft or Uber, especially if you have multiple destinations to your day. 6. Give Yourself Time: Before So you’ve reserved a car or you’re nearing the end of your time with your Getaround — whatever the case, give yourself some time on both sides of the reservation to prepare and wrap up in case of unforeseen bumps in the road. Load car with luggage, etc. 7. Give Yourself Time: After As the reservation comes to a close, you want to give yourself as much as 20-30 minutes to return your car to the space, as it was. Remove any trash/Starbucks cups, wrappers etc. 8. Give Time To Extend It’s annoying and a waste of money when you rent out a car for 4 hours and returning it with 1:15 minutes left. What a waste. To get around this and to best use Getaround efficiently, I always rent the car for an hour or three less than how long I think I plan on using it for. With Getaround, you can usually extend the car for no fewer than 15 minutes at a nominal $1-2 per quarter hour. By “shorting” the duration, you can extend the rental to exactly how long you need it. Just make sure to remember to extend and that the car is available to be extended. 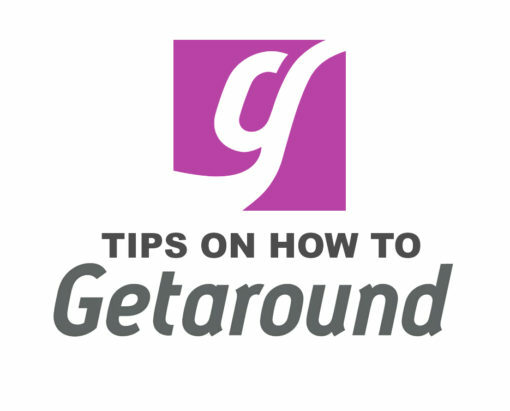 Getaround is still a new company and they’re continually building up the service and offerings, so there’s been a couple small bumps when I used the service early on. Since I mostly used the service in San Francisco, there’s usually a good selection of cars nearby and price ranges for my needs. If you need a car for a short period of time, I highly recommend the service. Have you used Getaround or do you have questions? I’d like to hear about your experiences with the car sharing service.